A bookworm of the highest order, Stephen Tanner has spent a lifetime culling meaning from literary works. The temptation was too great: Long shelves of paperback books. An open bookstore. A short walk from the church building. Lured by the promise of literary adventures in philosophy, religion, and history, Stephen L. Tanner skipped Sunday School. Now a BYU English professor and the university’s 2004 Karl G. Maeser Distinguished Faculty Lecturer, as a teenager in the 1950s, Tanner was captivated by those paperback volumes, sitting neatly on the shelves of a long, narrow shop on Washington Boulevard in Ogden, Utah. The store’s single aisle beckoned with the song of page-turning Sirens, and in it he discovered Homer, Emerson, and Hemingway. As the boy browsed the book covers, he mentally grazed on the ideas of the great minds of history as they grappled with timeless moral issues—the joys and sadnesses, the ideals and inequities of human experience. This Sunday School truant would grow up to embody twin ironies. First, he became the type of engaging teacher who just might have kept him in those church classes five decades ago. And the reformed sluffer became a champion of studying morality in the written word, making him anything but trendy in the latter stages of his career. Instead, he has thrown himself into the conflict about what our reading can or should mean to us, and he is an unpopular voice for finding Truth—capital T, please—in literature. Tanner, unsurprisingly, is a bookworm. But he’s a bookworm the way Godzilla was a nuisance. In the otherwise unfinished basement of his home, Tanner has an office with a desk, a computer, a file cabinet, walls of books, and a blue recliner. A stereo rests on a shelf, from which revered melodies emanate, surrounding Tanner while he reads. “I grew up with classical music wafting through the vents from his basement office,” says daughter Charlotte Tanner Poulton, ’89. What’s remarkable, though, is neither the music nor the recliner, nor the books piled around it. The peculiarity here is the number of books—on the floor and the shelves—with bookmarks inside. “I have a strange habit of starting many books and having them going at the same time,” he says. “I complete some many years later. I have hundreds with bookmarks in them.” On any given day Tanner could be in the process of reading more than a hundred books—and not just in English. He taught himself German and Portuguese and regularly devours books in those languages. This is not indicative of an inability to finish what he starts; Tanner completes several books each week. This is world-class browsing, born in that single-aisle bookshop on Washington Boulevard and repeated at libraries and bookstores around the world. Used bookstores, in particular, are riptides pulling him in and under—garage sales, too, but he is beginning to win on that front. Over the years, libraries at various universities honed his browsing skills. In addition to taking research expeditions to other schools’ book repositories, he received degrees at the University of Utah and the University of Wisconsin and taught at the University of Idaho before coming to BYU in 1978. “I wrote my doctoral dissertation in a carrel at the University of Wisconsin library,” he says. “Going from and coming to my carrel and during rest breaks I naturally browsed through the stacks and found all kinds of remarkable things, such as bound volumes of 1940s radio programs. The Jack Benny Show was there—the entire script, with the Pepsodent ads. “These were the kinds of books you couldn’t find in bookstores, especially today when bookstores are full of only marketable stuff. Part of the fun as a reader is making such discoveries. Browsing is a matter of serendipity, stumbling upon exactly what stimulates you but which you’d never have found without stumbling upon it by accident. Among the literary gold Tanner has prospected is a wide variety of authors—he doesn’t confine himself to a highbrow canon of books. One of his favorites is John Buchan, a Scottish writer and pioneer of mystery-adventure novels. Buchan was a primary influence on Sir Ian Fleming, creator of the James Bond books and movies. He also enjoys Raymond Chandler, Dashiell Hammett, Rex Stout’s “Nero Wolfe” novels, and Josephine Tey mysteries. Clearly, he prefers the mid-20th-century detective formula. “The contemporary ones tend to focus on the violent and sordid, and the heroes are more fallible and problematic and psychologically screwed up,” he laments. “I like the brilliant mind solving a puzzle. There’s still room for conventional heroes, even though they’re not realistic. I don’t need to know the detective is having all kinds of marital troubles. As such comments suggest, even in his recreational reading, Tanner never gets far from his literary approach, one that searches for truth and takes morality seriously. Holding to this creed, Tanner has crossed swords with much of his field for 40-odd years. The literary critic, raised on paperback classics, embraced a broad education—call it generalization—just as literary, technological, and academic trends began to push out the generalist and emphasize the specialist. While the best literature programs in higher education, including BYU’s, still stress breadth and coverage, the increasing number of colleges, students, and professors has allowed and necessitated academic research in literature to proliferate. In addition, the sheer number of books and authors makes true breadth difficult to achieve. Tanner believes universities no longer train students in the same fashion and expects literary generalists to become increasingly rare. If so, Tanner is himself a bridge to a bygone epoch. Tanner’s combination of literature, philosophy, and religion put him at odds with many in his field. 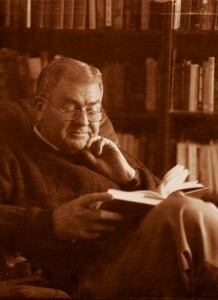 He has adopted a moral-philosophical approach in a time when contemporary literary theory holds that, as Tanner says, “there is no reading, only misreading. There’s no Truth to be discovered.” Tanner attacks those theories as stripping literature of important meaning. The perfection and precision demanded from both typewriting and tying flies reflect the discipline with which Tanner lives his life. Photo by Bradley H. Slade, ’94. If Tanner’s life has been devoted to learning from the range of human experience, he hasn’t been afraid to take that search within himself. In fact, he cherishes opportunities for solitude and introspection. 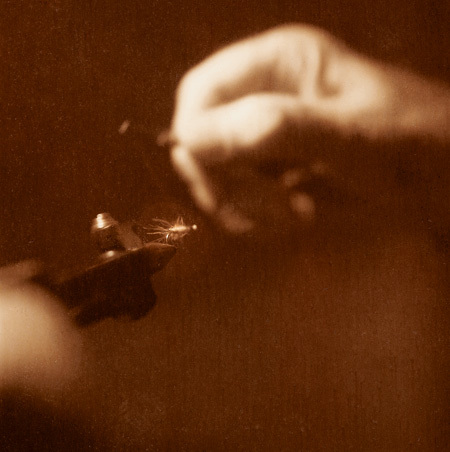 He loves fly-fishing, especially tying flies, and recently he wrote an essay about Ernest Hemingway and Zane Grey and their love of the sport. Solitude is a quality in short supply today, Tanner believes. His experience as a professor bears out his opinion. Tanner’s quest to engage students has led him from a distinguished teaching honor at the University of Wisconsin, where he did graduate work, to similar awards at BYU, including the Maeser Lectureship. He also participated in the Center for the Improvement of Teacher Education and Schooling at BYU’s David O. McKay School of Education. But he rededicated himself to transforming his methods after one particular experiment. But when Tanner questioned the students about the setting, many couldn’t remember anything about it. “They were looking ahead to movement in the plot,” he says, explaining that what is lost is a bridge between the reader and the experience of the book. Instead, Tanner tries to present facts, lay out an issue, and then act as a gardener. 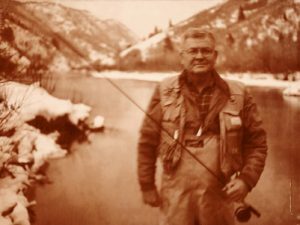 For 30 years Tanner has enjoyed the solitude and peace of fly-fishing on the Provo River. Tanner relishes the total mental absorption that the art of catch-and-release fishing demands. Throughout his career, Tanner has rigorously maintained his focus, leading to significant recognition, locally, nationally, and internationally. He has been honored with the Lionel Trilling Award, which recognizes scholars whose work has broad intellectual and moral implications, and has received four Fulbright Senior Lectureships, one to Portugal and three to Brazil. The discipline that has helped him achieve such honors is evident in his approach to writing. It is a talent he has applied to a dizzying array of essays and articles on subjects as diverse as James Thurber and Sinclair Lewis, trout fishing and war metaphors, spiritual values in the popular western and similes in novels by Raymond Chandler, the humor of E.B. White and gender conflict. He has written four books plus nearly 200 chapters, articles, papers, and reviews. To do his work, he purchased an Olympia manual portable typewriter in 1958 while on his mission in Michigan. He still uses it occasionally, but it once was his trusted companion. Years ago, Tanner climbed into the passenger seat of a friend’s car for a long drive to a favorite fishing spot in Montana. Tanner surprised his fishing buddy by pulling out his Olympia typewriter and setting it on his lap; a deadline loomed. He pecked away for hours, with intermittent long stares out the window. He remains distrustful of the desktop computer in his office in the Jesse Knight Humanities Building because using a word processor makes it too easy to move around paragraphs and chunks of text, something that feels, given his painstaking style, too undisciplined. Despite his disciplined writing and his tenacious fight for morality in literature, Tanner has a relaxed, almost quirky side. He collects pocketknives—each of his grandchildren has received at least one as a gift—and is a font of folk songs. From folk songs to detective novels to fly fishing to literary classics, Tanner is clearly a man of broad interests. But at his core he is still that teenager in Ogden who loves to slip away and read a good book. Passing on that love of reading to students, children, and grandchildren has been a quest that has come naturally. Tad Walch is the Utah County Bureau chief for the Deseret Morning News. As the 2004 Karl G. Maeser Lecturer, on Oct. 26 Stephen Tanner delivered a BYU forum address titled “What Are You Thinking?” The subject of his address was solitude and reflection. To read the full text, go to more.byu.edu/stephentanner. In reviewing my title after it was announced, I realized that it could mean different things depending on which word is emphasized: What are you thinking? meaning, What exactly is going on in you head? What are you thinking? meaning, If I have misunderstood you, exactly what did you mean? What are you thinking? meaning, I’ve told you what I think; now give me your ideas. What are you thinking? meaning, You couldn’t have been thinking at all. Perhaps what I am going to say touches upon more than one of these meanings. Have you ever stopped to consider how many synonyms we have for the words think, thinking, and thought? Some are part of our active vocabulary and are familiar friends—words like ponder, muse, reflect, reason, meditate, contemplate. Some are part of our recognition vocabulary and, although we may not be on intimate terms with them, they are not total strangers—words likeruminate, cogitate, and ratiocinate. Others stretch our recognition vocabulary and seem a little exotic—words like ideate, mentate, and cerebrate. Still others seem like creatures from another planet and have to be beamed up by means of a dictionary—words like perpend, noesis, and lucubrate. The total of these single-word synonyms makes a hefty list. Then when we add phrases likepuzzling over, mulling over, stewing over, soul-searching, putting on one’s thinking cap, and using the old gray matter, the list rapidly expands. I gave up my count at around 50. I suppose these many synonyms might be considered a tribute to the human mind, that extraordinary faculty and supreme treasure of the human species, which distinguishes us from other animals. I flatter myself with the notion that we need so many synonyms in order to delineate the subtle nuances of our rich mental activity. Then, with my head in the clouds, I stumble over the disconcerting fact that the most serious pondering I’ve done recently is whether I’ll have fries with that. Suddenly my list of synonyms seems like linguistic overkill, mere lexicological extravagance or featherbedding. When I consider the mindless sensory overload that characterizes our electronic age, I begin to wonder if we need 50 synonyms for thinking any more than Samoan Islanders need 50 synonyms for snow. If this observation prompted an “alas” followed by an exclamation point from Coleridge in the early 19th century, it should prompt even greater alarm today, when in an apparent flight from solitude we eagerly eliminate every opportunity to be quietly alone with our thoughts. We are deluged with distractions and opportunities for diversion. Thousands of advertising appeals bombard us each day in the form of newspapers, magazines, circulars, signs and billboards, radio, television, and computers. Cabelas even wants to conscript me into the mighty army of advertising by having me wear their label on the outside of my fleece jacket. We are subjected to background music in every waiting room, restaurant, store, and telephone hold. I have even pumped gas to hits of the 70s. And try escaping television and cell phones at the airport. Not only is sensory stimulation thrust upon us, we eagerly inflict it upon ourselves. Our homes have numerous handy switches for turning off silence. Our cars, wired for sound (super bass: ka-whump-chugga-whump-chugga-whump), entice us to dash about at the slightest pretext. Cell phones guarantee that we never have to close our mouths and ears for any dangerous interval of time. A generation of children is squandering time in computer games, which may sharpen reflexes but which certainly preclude reflection. They will develop eyes the size of cantaloupes and brains the size of peas, I heard somebody wisecrack. We are sucked into this flux of perpetual sensory stimulation to the point that solitude, if we have the apparent misfortune of stumbling upon it, seems odd and uncomfortable. Our overstimulated lives give point to Pascal’s famous observation that the sole cause of man’s unhappiness is that he does not know how to stay quietly in his room. No, I don’t think replacing mindless sensory overload with mindless forms of trendy meditation is a solution. What is desired is reflection that transpires within everyday lives and that evaluates those lives, assesses values, sets goals, solves problems—in short, that creates examined lives, the only kind that Socrates said are worth living. What is desired is the kind of pondering in the heart recommended repeatedly in the scriptures. Unfortunately, our society provides little encouragement and few models for quiet pondering. We are celebrity worshipers, and thinkers among us don’t earn celebrity status, partly because they are crowded out by film and rock stars, television personalities, and athletes, but mostly because productive pondering is an inner achievement not on external display. There is, of course, the famous statue of The Thinker, created by the French sculptor Auguste Rodin, but perhaps it is so famous because it stands alone among the myriad statues of other sorts of heroes and celebrities. One would think that if we truly revered thinkers, the figures of more of them would have turned up on pedestals. The Thinker didn’t receive its present title until nearly 20 years after it was created. Unfortunately, this figure has generated thousands of parodies, jokes, and commercial rip-offs. I suppose this is partly because, like the Mona Lisa, it is so famous. But I suspect a deeper reason. The world is not entirely at ease with thinkers. As Ralph Waldo Emerson once said, “Beware when the great God lets loose a thinker on this planet. Then all things are at risk” (Selections from Ralph Waldo Emerson, ed. Stephen E. Whicher [Boston: Houghton Mifflin, 1957], p. 172). Moreover, we are slightly puzzled by a muscular thinker. We suffer from a preconception that separates brains from brawn. This shows up in popular culture in the stereotypical distinction between nerds and jocks, bookworms and bullies. Rodin himself sensed the incongruity between scrawny Dante and the muscular figures of his portal. The Thinker, as a sort of nerd with abs of steel, a poet body-builder, slightly bewilders us, and we respond with jokes and parodies. Based on our own mental habits, it may be hard for us to believe someone can think with knitted brow, distended nostrils, compressed lips, clenched fist, and gripping toes. Whether I am right about this or not, mass values and mass media certainly provide neither incentives nor models for constructive pondering. I’m afraid that most of what is now playing in the theater of my mind is the kind of day-dreaming James Thurber portrays in his famous story “The Secret Life of Walter Mitty.” You will remember that Walter Mitty is a brow-beaten husband accompanying his wife on a shopping trip. When left unattended he lapses into fantasies in which he is a naval pilot flying through a hurricane, a famed surgeon performing a stunning medical procedure, the greatest pistol shot in the world, an heroic military captain, and a man facing a firing squad with utter calm and disdain. When his domineering wife, who has trusted him to buy the overshoes she insists he wear, says, “Couldn’t you have put them on in the store?” Walter replies “I was thinking. Does it ever occur to you that I am sometimes thinking?” (My World—and Welcome to It [London: Methuen, 1942], p. 18). Walter, of course, was not thinking or meditating; he was “Mittytating.” And much of what passes for meditation among us could more accurately be classified as Mittytation. I confess that I am a master of Mittytation, with a nearly infinite list of credits as writer, producer, director, and starring actor of inner adventures. There is a sameness in plot, but plenty of variety in children rescued, buzzer-beating jump shots swished, ninth-inning homers belted, and award-winning books written. It takes up most of my spare time. When interrupted, I answer as Walter did: “I was thinking.” Similarly, when my wife nudges me in church, I inform her that I was meditating. Daydreaming is not all bad, of course, even though its self-indulgent forms are pretty pathetic. Our lives would be bland, after all, if bereft of inner fantasies. And in its more respectable, less self-indulgent forms, daydreaming is a vital aid to our creating and planning and self-constructing. Thoreau was correct when he advised, “If you have built castles in the air, your work need not be lost; that is where they should be. Now put the foundations under them” (The Portable Thoreau, ed. Carl Bode [New York: Viking, 1975], p. 563). If daydreaming slips so frequently from meditation into Mittytation, aren’t we much better off reading books? That’s a comforting thought for those of us who love reading. I’m a literature professor. Reading for me is both vocation and avocation. What better way to improve my time, I flatter myself. But occasionally while reading I get the uneasy feeling that if I looked in the mirror I would see a child sucking on a binky. And each time I teach Emerson’s “The American Scholar” I am stung by words like these: “Man Thinking must not be subdued by his instruments. Books are for the scholar’s idle times. When he can read God directly, the hour is too precious to be wasted in other men’s transcripts of their readings” (Selections from Ralph Waldo Emerson, p. 68). Without “creative reading,” Emerson warns, Man Thinking becomes merely the bookworm. Reading can be an aid to thought, but only if it is thoughtful reading—what Emerson called creative reading. Even scripture reading, in order to be truly edifying, must be an exercise of the active soul. The scriptural admonitions are always to search, ponder, and meditate, and not simply to read. I have focused on the difficulty of cultivating the habit of quiet reflection, which is an art as well as a habit, an art of which every person should be master, for if we are not thinkers, to what purpose are we human beings at all? Life consists, after all, in what we are thinking each day, and we should value our days by the number of clear insights we have gained. To appreciate the difficulty of focused pondering, try this thought experiment. Select a subject or problem and, with watch in hand, try to focus your mind upon it unswervingly for a determined number of minutes. The first time I attempted this I aimed for five minutes. Forty seconds later I was wondering why my watch was in my hand. Granting that your power of concentration may be greater than mine, you will find nevertheless that within seconds the random images and chance associations that form the currents of our stream of consciousness have swept you off course. Contemplation requires an inner check, a withdrawal from that mental-emotional flux long enough to reorient oneself and set a new course. Do I have any suggestions for cultivating the art and habit of reflection? Only a meager few. First, I recommend pondering, at least occasionally, in words—in words in the sense of self-consciously selecting words and formulating sentences in a silent inner discourse. Pose questions to yourself and propose answers, hearing the sentences in your mind, revising them for clarity and precision and even eloquence. This requires focused concentration that reduces the swervings and deflections I described in the thought experiment I just spoke of. It gives order and continuity to our reflection and promotes a feeling of companionship with our inmost self, a more vivid awareness of the reasoning, creating voice within. This deliberate process of articulation becomes discovery as well as expression. 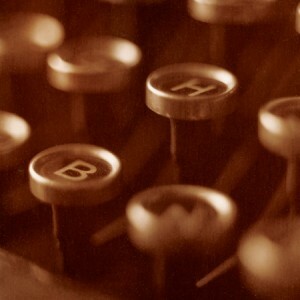 More than one writer has said, “I don’t know what I think until I have written it down.” Something similar holds for inner composition as well. Words do not merely express our thoughts, they make our thoughts. Second, I recommend pondering about words. Accustom yourself to reflect on the words you hear and read and use—on their derivation and history, their denotation and connotation, their plasticity to context. Don’t take words for granted. Many common words serve multiple purposes, acquiring definite meaning only when placed in particular sentences. Thought and often careful reflection is required to interpret the specific instance. Many cases of fuzzy thinking, misunderstanding, indecision, and argument can be resolved by thoughtful clarification of terms. “For if words are not things,” says Coleridge, “they are living powers, by which the things of most importance to mankind are actuated, combined, and humanized” (Aids to Reflection [New York: Chelsea House, 1983], p. xix). It is not what we reflect upon that is so important as the habit of reflection itself. Even pondering small things can have large consequences, whether it is Newton musing on the fall of an apple, Galileo contemplating a swinging censer, or a 14-year-old New York farm boy pondering a single verse in the New Testament. Moreover, ideas evolve and conclusions melt away in the heat of new experience. Few matters are settled completely or manifest in their fullness once and for all. But the impulse of the active soul toward quiet reflection remains the perennial source of personal fulfillment and communal benefit. Stephen L. Tanner is BYU’s Ralph A. Britsch Humanities Professor of English. As the 2004 Karl G. Maeser Distinguished Faculty Lecturer, Tanner delivered this forum address Oct. 26, 2004, in the Marriott Center.